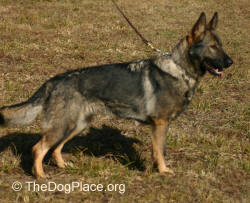 German Shepherd Dog photos, characteristics and information on the GSD as a family pet, AKC show dog, plus Czech or East German working type. The German Shepherd dog is a breed most of us know well, but do we really know them at all? There are four distinct styles of German Shepherds and they are as different from one another as are donkeys and zebras. They all have erect ears, most are black and tan, black and red, or sable, all have long tails, but there the similarities end. The most common GSD is the pet type German Shepherd, known euphemistically in the South, as Old Timey Big Bone. This is a large substantial dog, typically semi-smooth coated and straight legged with a level topline. They are territorial and generally fairly strong in temperament. Many times these dogs have white shepherds in their backgrounds. This is the type of dog you will see in farm yards and junk yards. They are purebred and registered but will seldom have a Ch or Obedience title holder in a four generation pedigree. Seen on the righta typical female, heavily in whelp. Next is the American Show Shepherd. These are elegant dogs with sloping toplines and very well angulated front and rear. They are judged heavily on sidegate and topline. 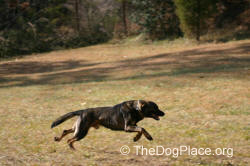 In the main, most of the aggression has been bred out of these dogs. 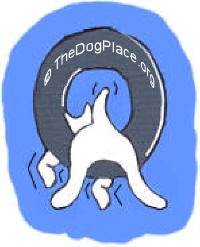 An aggressive dog does not do well in the showring. There are show shepherds that have obedience titles but very few with protection titles, i.e. Schutzhund. They make impressive show dogs and nice pets but have a distinct tendency to be nervous and timid. There is a loose lead temperament test in the showring but more of the dogs have to be trained past timidity than past aggression. 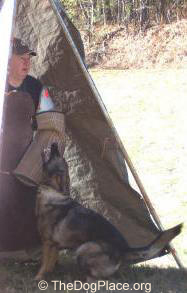 In German conformation and schutzhund competition, the dogs have to be steady to gunfire. If one were to fire a gun in the AKC show ring, it would leave the ring clear of dogs except for the ones cowering on their bellies. Very few American Show shepherds will bite. The incidence of hip dysplasia is much lower than in the past. 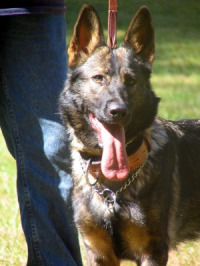 The third type is the German show Shepherd. They basically adhere to the famous quote of Max von Spephanitz, “Above all, keep my dog a working dog.” Most of this type are black and red, some black and tan. They have a different topline than the American show type but are also judged heavily on side-gait. 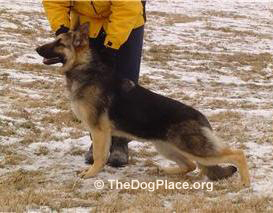 Long coated shepherds may come from German show lines. 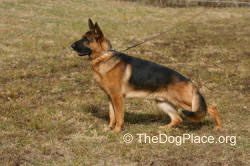 The temperament is somewhat stronger in the German-bred GSD than in the American show types because to gain the highest ratings, a Schutzhund (protection) title is required. Clean movement, not cow hocked, is much valued in this type which often has a roached or curved backline, not the straight and sloped of the American show shepherd nor the straight and level back of the American generic shepherd or the working style. The colors tend to be much stronger with even some blacks in the German working style GSD. Most are fairly large, heavy boned, and impressive. 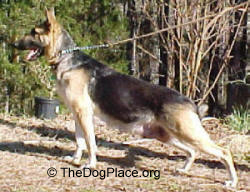 The working type German Shepherd Dog is mostly either Czech or East German in origin. These dogs tend to be more what the founder of the breed, Max Von Stephanitz, had in mind when the breed was created. Many are dark, either sable or black and tan, some appear all black. They are somewhat lighter in bone and shorter backed than the other types. Smaller ears and less overall exaggeration. They are what I see as the RinTinTin type of Shepherd. These guys have an unequaled work ethic. 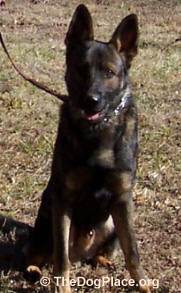 They are bred for border patrol and police work and excel in both. 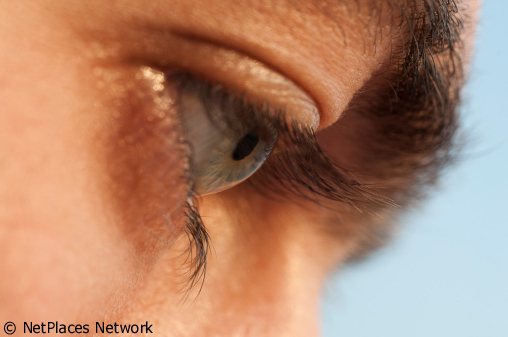 The kindness and consistency with which this type is trained determines his behavior. If treated with kindness they will be kind, if treated harshly they will be harsh in return. Often seen as being aggressive but that is far from the truth in most of this type. STRENGTH OF CHARACTER IS PARAMOUNT.. Strong nerves combined with great trainability make the German Shepherd Dog a candidate for all types of police, search and rescue, and guide dog work. This is the type of dog who would willingly lay down his life for you, while lovingly guarding your child or elderly parent. That uncanny ability to spot breed quality in a great dog. 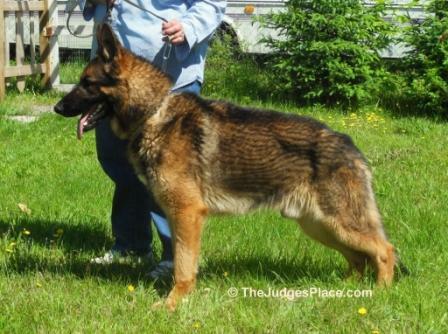 Judge provides a pictorial discussion of GSD show dogs.